Old Colorado City- Established in 1865 as the newly created Colorado Territorial Seat. Colorado City represented 'civilization' in this wild West region dedicated to mining and ranching. 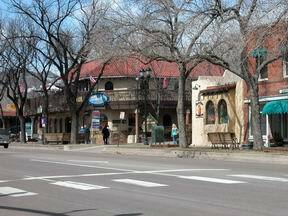 The town flourished and grew until the railroad passed it by in deference to newer Colorado Springs and its more touristy off-spring, Manitou Springs. Since 1975, 'Old Town', once blighted and slated for Urban Renewal, has been on the move. New shops, galleries, boutiques and restaurants have opened, buildings have been repaired and restored and a vibrant community has replaced rundown homes and businesses. Work continues today to preserve and protect this historic part of Colorado. We invite you to walk the streets, soak up the history and check out our array of places to shop, dine and relax. In the Pikes Peak area of central Colorado, you will find: amazing natural beauty, terrific recreational and entertainment opportunities and friendly people who want to make your visit a pleasure. 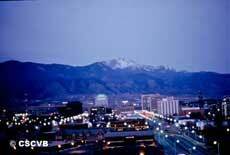 Our diverse area is composed of numerous mountain towns adjoining Colorado Springs. All of these little cities have their own appeal and offer their own variety of history and charm to the visitor wanting to see as much of Colorado as possible. In 1904, Katharine Lee Bates was inspired by the beauty of the area and wrote the words to “America the Beautiful”. 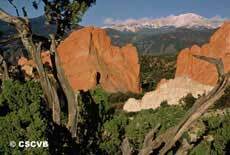 We want you to enjoy the many wonders of the Pikes Peak area, and experience the inspiration for the American song. 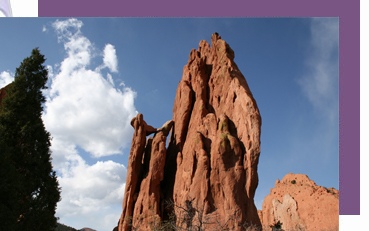 The first residents of Colorado Springs were the native Ute, Cheyenne, Kiowa, and Arapahoe Indians. In 1872, General William Jackson Palmer founded the Denver and Rio Grande Railroad and the city of Colorado Springs. He envisioned Colorado Springs as a resort area which led to the city receiving its first nickname, “Little London”. The gold rush of the 1890s led to a new nickname, “city of millionaires”. The 300 days of sunshine and dry moderate climate made the area popular for people suffering from tuberculosis. Another visionary who struck it rich in the gold mines, Spencer Penrose, gave extensive park land to the city and bequeathed an endowment that today finances philanthropic city events. With a population of 400,000 and growing, Colorado Springs has evolved from an untamed frontier town to the nation’s 81st largest city—a cosmopolitan city with a symphony, performing arts center, dance theatre, parks, festivals, a rodeo, and many historical and art museums. Colorado Springs is home to several fine educational institutions including the Air Force Academy, Colorado College, and the University of Colorado, Colorado Springs. The Colorado Vacation Directory accommodations and fun things to do such as fishing, rafting, hunting & skiing. As well as, a detailed regional Colorado map section. Customize your trip and travels. Find all of your Pikes Peak Country Attractions here!